Ads? In My Parking Garage? I was greeted to this ad just the other day. It was strategically placed on a wall in the lowest level of the parking structure at work. While not as strange as, oh I don’t know, a Viagra ad above a urinal, this definitely got my attention only because it was in a place I never expected it to be. With Volkswagen’s introduction of the Tiguan, they hope to snag a piece of the small SUV market which already seems to be over saturated with RAV4s, CR-Vs, Escapes, VUEs, Rogues, Nitros, Elements, Santa Fes, Sportages…hell, might as well bring back the Daihatsu Rocky. Goofy names aside, I shamefully admit to learning how to drive a stick in an old VW van that smelled like pot and rotting seats (but then again, which one didn’t?). And if given the opportunity to own an extra ride, I’d probably want one of these. 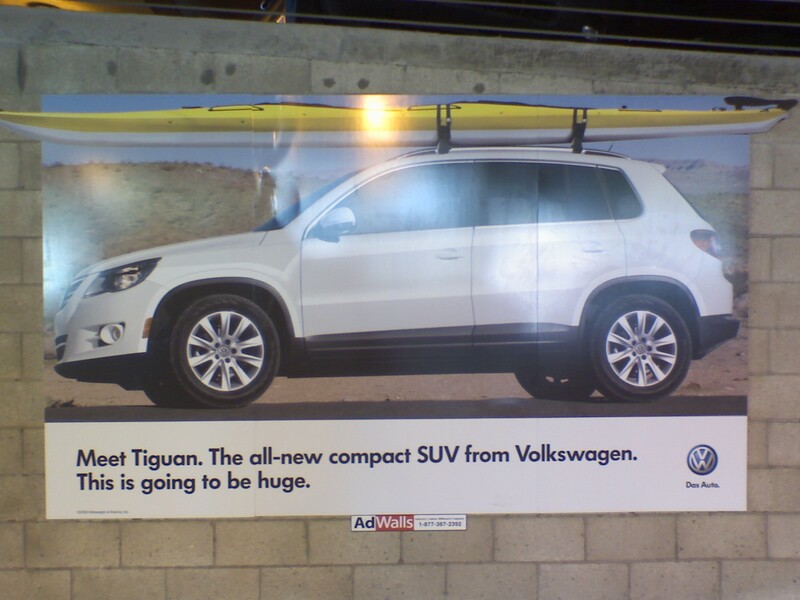 This entry was posted in Advertising, Cars, Daily Commute, LG enV VX9900, Life, Media, Phone-Cam, Photography and tagged advertisement, Cars, parking garage, volkswagen, volkswagen tiguan by Dave. Bookmark the permalink. As somebody who currently drives a RAV4 and has driven a suped-up Tourag (otherwise known as the Cayenne), VW doesn’t know how to make an SUV. Frankly, I think VWs are getting worse and worse every year. I’m hearing way too many horror stories about Volkswagens these days. I admit the R32 is definitely eye candy. I’d have to drive the thing first to form an honest opinion. One of the craziest rides I had was in a Mitsubishi Eclipse GS-T (or GSX, I forget). That thing was just insane.